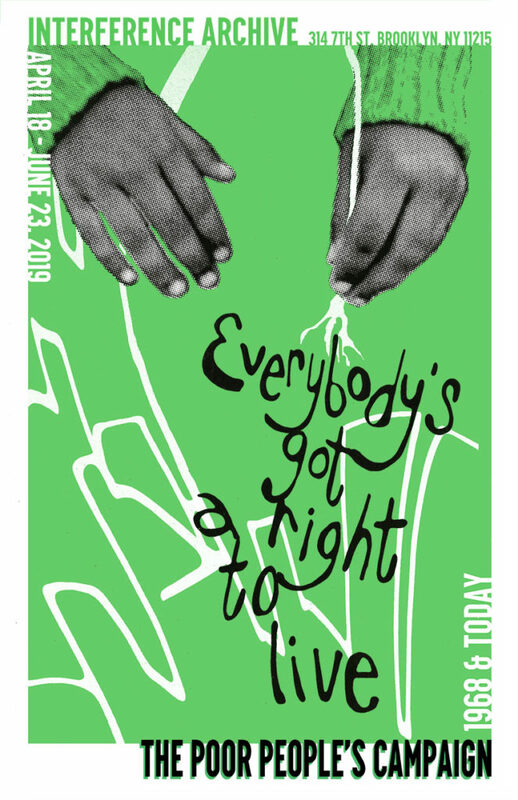 Join Interference Archive, and local leaders and organizers from the NYC Poor People’s Campaign for the opening of Everybody’s Got a Right to Live: The Poor People’s Campaign 1968 & Now. The exhibition will launch with a reception at 6 p.m. followed by a special teach-in at 7 p.m. on the history of the 1968 Poor People’s Campaign and current efforts to re-ignite the unfinished business through the Poor People’s Campaign: A National Call for Moral Revival. Engaging visual materials from the campaign (banners, flyers, books, buttons, photographs) and featuring posters created in solidarity with the Justseeds Collective, we will explore how we continue to move art into action. The Poor People’s Campaign struggled to define itself as a multi-axis movement while it faced political suppression from the state, ultimately derailing its reform goals and leading some to consider it a failure; however, its spirit and intention has carried on into the present day within a growing resurgence campaign seeking to call attention to the unmet demands of ‘68. The Poor People’s Campaign: A National Call for Moral Revival, led by Reverend William Barber II and Reverend Liz Theoharis, now responds to an ever-worsening poverty crisis. At the forefront of the new grassroots campaign’s concerns is the acceleration of economic inequality, but they also seek to address many of the more insidious structural inequalities that arise out of conditions of poverty: new unjust policies like voter suppression laws, mass incarceration rates that further entrench the U.S.’s systemic racism, a growing imbalance in federal discretionary spending on the military relative to social programs, and the intensification of racial and income disparities in access to clean air and water. This exhibition provides a look at some of the visual culture of the original PPC, including photographs of marches and rallies, press coverage, and a contemporary public response to a mural in Resurrection City called the ‘hunger wall,’ in addition to showcasing the efforts of the new PPC and a portfolio of Justseeds posters created in solidarity with their actions.